Rashaad Newsome, Running, 2017. Park Avenue Armory. Photo © Da Ping Luo. Photo courtesy Rashaad Newsome Studio. At the beginning of November I attended the premiere of Rashaad Newsome’s Running at the Park Avenue Armory. The audience was led blind into the building’s Veterans Room. I hadn’t come with a friend, and as I sat waiting, the chatter of others seemed extraterrestrial, words muffled by black. Rashaad Newsome, Running, 2017. Photo courtesy Rashaad Newsome Studio. When I took off the blindfold, prompted by an announcer, the darkness had become familiar. A percussive prelude to an original score by Newsome began to be played. Then the first lone figure, spotlighted in red, raised his voice. RUNNING from RASHAAD NEWSOME on Vimeo. 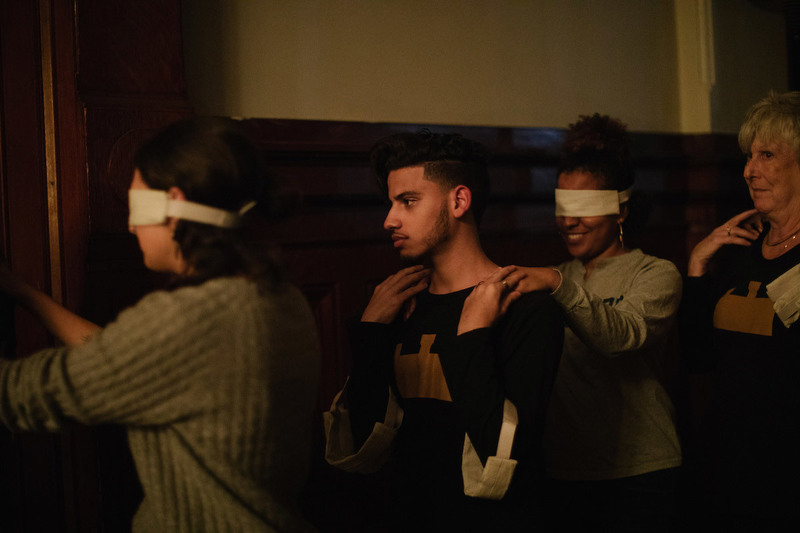 The performance is composed of improvised vocal embellishments by Kyron El, Aaron Marcellus, and Devin Michael—rapid series of ascending or descending musical notes sung in quick succession. They take turns to perform their “vocal runs,” and when at the end they raise their voices, running in unison, their dulcet tones sound to me like waves, one eddy streaming into another. I imagine an anthem for the African diaspora, always coming to terms with, and existing in spite of, the twin catastrophes of slavery and colonialism. I imagine voices guttural and exhilarated, as in an Arthur Jafa film, where the scream of despair is contiguous with the rapture of joy. On occasion, voice samples are interjected into the pulsing rhythm of the music: Walter Cronkite’s report on Martin Luther King Jr.’s assassination, aired on the CBS Evening News on April 4, 1968; George Zimmerman’s phone call to police before he killed Trayvon Martin; the sound of an innocent man’s lynching in the 1997 film Rosewood. Newsome’s Running, which ends with Eric Garner’s plaintive refrain, “I can’t breathe … I can’t breathe … I can’t breathe,” is thus the singing in the dark, for the dark times. Rashaad Newsome, Efua, 2017. Collage on paper. 43 x 31 1/4 x 2 3/8 inches. Photo courtesy Rashaad Newsome Studio. Consider Running the vocal accompaniment to Reclaiming Our Time, Newsome’s current exhibition at De Buck Gallery in New York City. Where the performance is an abstract portrait of soul, the collages indicate, as Newsome wrote in an email to me, “an abundance of possibility … a diverse sense of coalition and relating.” That diversity is black, queer, and future. 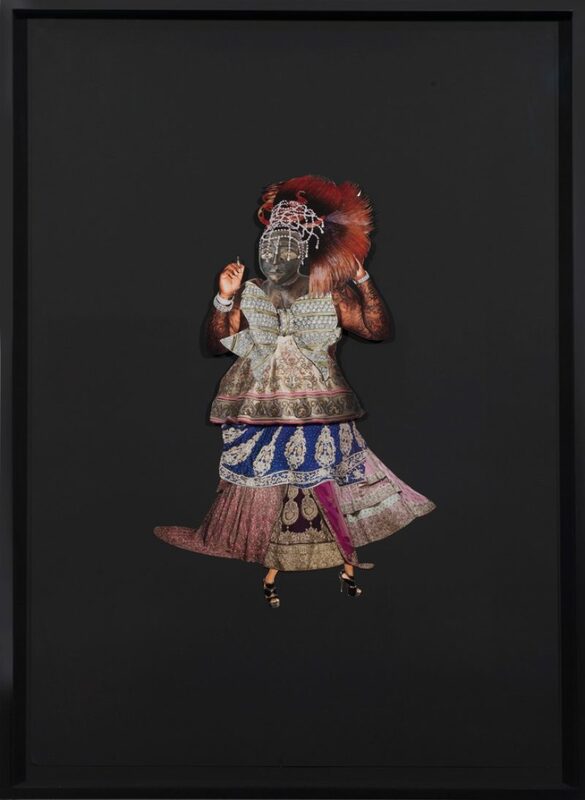 The figures in the collages (“figures” is a provisional word), their forms a mélange of genders, wear anything from Baroque ceilings to brocaded skirts and petticoats. Reclaiming Our Time. Installation view. Photo courtesy Rashaad Newsome Studio. Time in relation to the images of sculptures used in the collages approximates what has been passed to the present, and how an artist reckons with that. Quite similar to the ways in which Running’s performers sample the vocal runs of their ancestors—Aretha Franklin, Patti LaBelle, Whitney Houston, Marvin Gaye, B.B. King, among others—whose genius cannot be extinguished, now or ever, Newsome’s collages layer one time over another. American popular culture coexists with older forms of African art. Linear time is breached. Rashaad Newsome’s Running was performed at the Park Avenue Armory in New York on November 7, 2017. 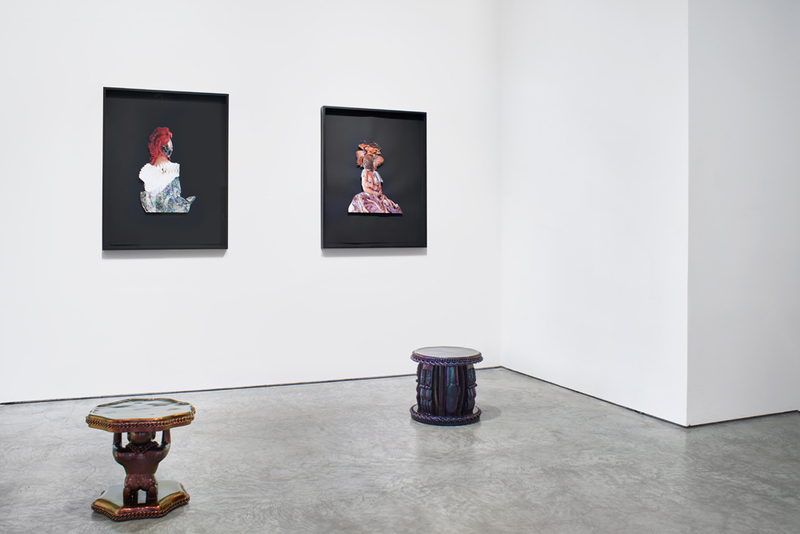 His current exhibition, Reclaiming Our Time, is on view at De Buck Gallery until December 9. Emmanuel Iduma is the author of The Sound of Things to Come, a novel. He contributes essays on art and photography to a range of journals, exhibition catalogues, and artist monographs. The editor of Sarabamagazine, he is a faculty member of the MFA Art Writing program at the School of Visual Arts, New York. He is the recipient of a 2017 Creative Capital/Andy Warhol Foundation Arts Writers Grant.